A morion is a tall, dome-shaped infantry helmet from the 16th and 17th centuries, featuring a rim and upswept front and rear peak. The introduction of the morion coincided with the exploration of North, Central and South America. Explorers like Hernando de Soto and Coronado may have supplied them to their foot soldiers in the 1540s. The example shown here is a rare, 16th century Spanish (or Italian) combed morion that sold for $7,675 and was the top lot at Militaria Auction #77, a catalog and internet auction held June 16-17 by Mohawk Arms, Inc., online and at the firm’s gallery in Bouckville, N.Y. Mohawk Arms holds two major militaria sales per year. Although the morion is mostly identified with early Spanish explorers and conquistadors, it was not in use as early as the conquest of Mexico by Hernan Cortez, or Francisco Pizarro's conquest of the Incas in South America. But in 30-40 years’ time, it was widely used by the Spanish, and was common among foot soldiers of many European nations, too, including the English. 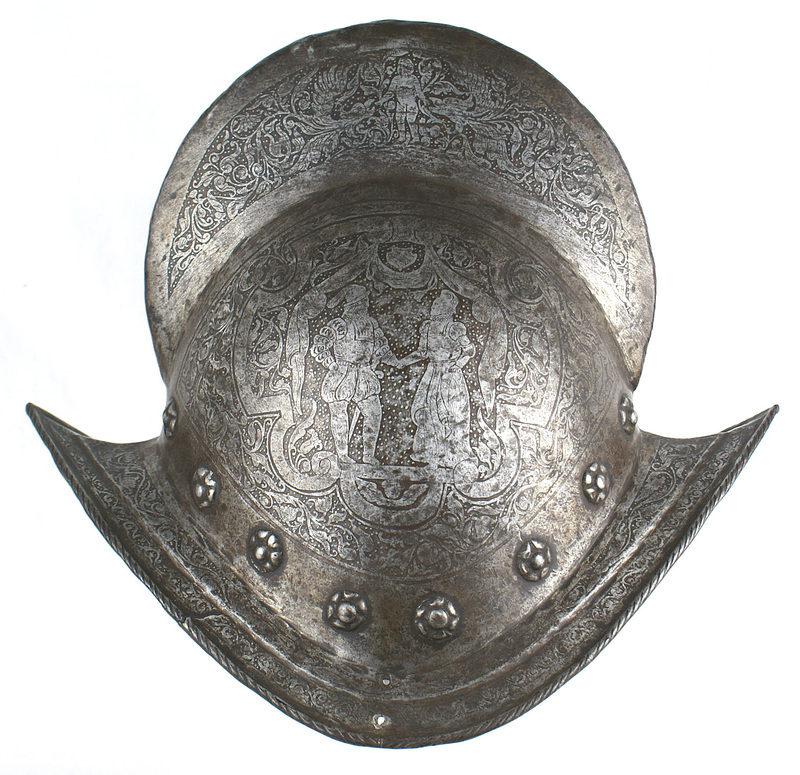 The first English morions were issued during the reign of Edward VI and were nicknamed the “pikeman’s pot.” But the origin of the morion is purely Spanish; in fact, the Spanish term for the helmet, morrión, is derived from the noun morra, which means "the upper part of the head.” See? Si.